Skye Gravestones | Janet & James Matheson, d. Patricia Lesley. Janet & James Matheson, d. Patricia Lesley. 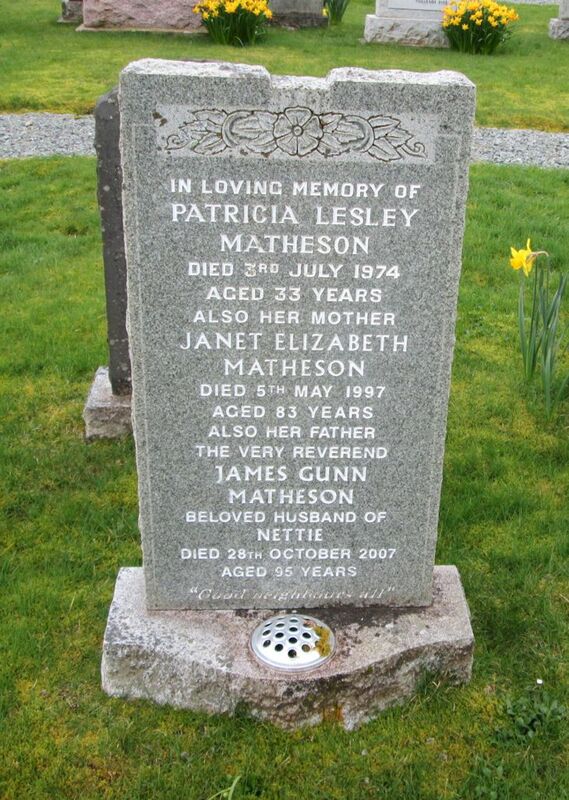 In loving memory of/PATRICIA LESLEY/MATHESON/died 3rd July 1974/aged 33 years/also her mother/JANET ELIZABETH/MATHESON/died 5th May 1997/aged 83 years/also her husband/the Very Reverend/JAMES GUNN/MATHESON/beloved husband of/NETTIE/died 28th October 2007 aged 95 years.